I often have a craving for lemon ice cream in the summer. Not lemon sorbet – I mean the real deal. Lemon ice cream. It reminds me of holidays in France, scorching sunny days cooled down by this refreshing treat. However, it can be hard to get hold of in this country (you have to really make an effort to find it), so I resolved to make some myself. I had an old recipe I’d made years ago, but the scrap of paper it was written on had seen better days, so I took a glance at what I could determine from it and made the rest up. This is my rambling prelude to an apology for the impreciseness of the recipe below, as it relied heavily upon what was in the fridge. Heat the cream with the sugar and zest to scorching point (just under the boil). Leave to cool and infuse for around 4 hours. Stir in the lemon juice. 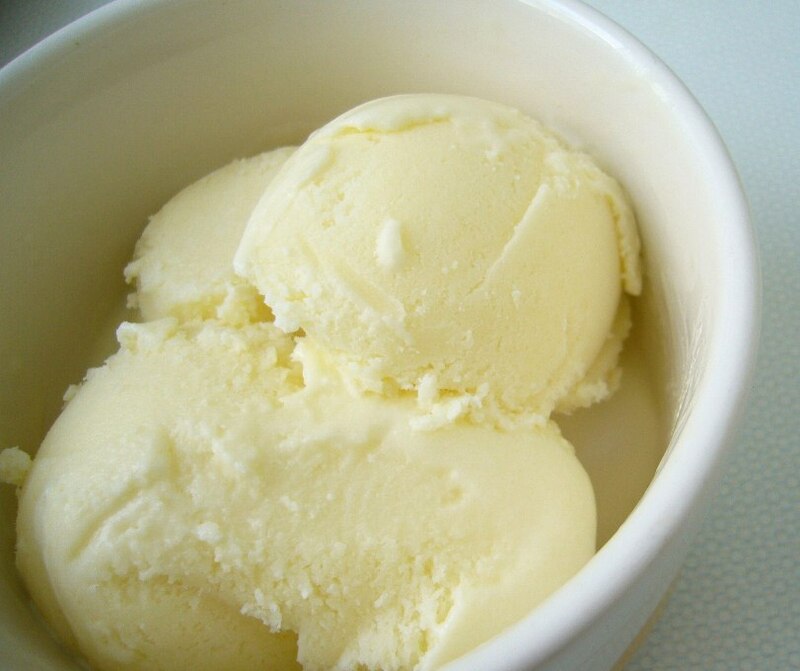 If you have an ice cream machine, strain out the zest and transfer it into there to freeze. If you don’t, strain and transfer to a tupperware container and place into the freezer. After 45 minutes, break up the ice crystals that begin to form with a spatula or other utensil by stirring briskly, breaking up the frozen bits around the edges. Return to freezer and repeat around every 30 minutes or so until it is frozen. This should take 2-3 hours and will ensure a smoother, creamier ice cream. Melty cold sweet tangy creamy refeshing ice cream. Perfect.